If you’re like most people, you made a few New Year’s resolutions this January. Perhaps you wanted to lose weight, get a new job, learn a new skill, or undertake some other self-improvement initiative. Perhaps you’ve made some of these for several years in a row. How are you doing on your resolutions this year? If you’re like most people, life probably got in the way, and you gave up. Learning on Coursera is similar. It used to be that you had to uproot your life to go back to university. Coursera revolutionized that process by offering courses from top universities completely online. Finding and enrolling in a course is now as easy as making a New Year’s resolution. Millions of learners worldwide have transformed their lives and careers thanks to Coursera. However, just as with New Year’s resolutions, many millions struggle to make meaningful progress. This is the story of our efforts to help these learners. When Coursera was founded, courses on our platform resembled their on-campus equivalents. Courses were offered once or twice a year, aligned with the fall or winter semester, with very few offered in the summer. 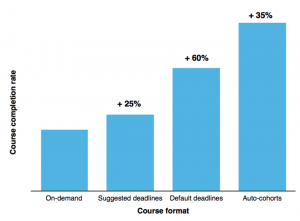 Courses had deadlines, with real penalties for late submission. We learned that the online learner is different from the on-campus learner and needs flexibility, convenience, and a simple, on-demand experience. Based on these insights, we launched a new experience that did away with many of the features of a traditional on-campus class – no enrollment deadlines, no assignment deadlines or schedules, and a completely self-paced experience. We had completely changed the structure of our courses, but the obstacles facing our learners were still the same. Life still got in their way. And when it did, we had inadvertently made it even easier for them to forget about their goals. Act 3: The obstacle is the way! We had redesigned our learning experience to eliminate the obstacles facing our learners. Having failed with that approach, we decided to change our strategy to give learners the tools and motivation to overcome obstacles. Like any good coach, our product needed to show some tough love – hold learners accountable and push them to do more, but back off when learners were truly unable to keep up. Through a series of 20+ A/B tests we finally settled on a course format called “auto-cohorts”. Courses are offered every 1 to 4 weeks depending on demand. Learners always start as part of a cohort (i.e., a group of learners who belong to a “virtual classroom”), so that they’re surrounded by peers who can answer their questions and providing feedback on their assignments. There are also weekly deadlines and milestones to keep learners on track. They are encouraged to go as quickly or slowly as they want, and have the option to switch to a later cohort if they fall behind. They never need to re-do any coursework, even if they switch to a later cohort. 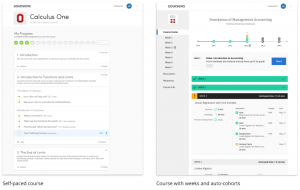 Before (left): Self-paced course provided content without deadlines or cohorts; After (right): Course is offered on a schedule, is broken into weeks, and saliently reminds learners to stay on track. With these changes, we’ve been able to dramatically increase the likelihood of success among learners on our platform. More learners are able to complete courses on schedule, and because of our flexible schedules, we are able to help many thousands of people who would have otherwise fallen through the cracks. The chart below shows the relative increase in course completion rate for each product change we made. Most learning products swing to the extremes – they’re either extremely accessible with very little scaffolding, or they include many constraints so that only the most motivated learners are able to access them. The balance between broad accessibility and high retention was difficult to strike. It took many months of tinkering and persevering through disappointing failures to arrive at an experience we believe is consistent with our mission. We hope this story gives you some insight into our product decisions, and motivates you to complete your next course.